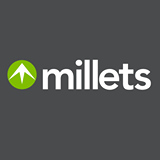 Millets is a long established UK store selling outdoor clothing, footwearand camping equipment. If you are looking for waterproof Jackets, Tents, Sleeping Bags or Walking Boots – Millets will have them. They sell the top brands such as The North Face , Berghaus , Peter Storm and Craghoppers. Good outdoor clothing and footwear needs to be breathable – to allow air to move freely (without letting warm air escape to defect insulation) to help prevent you from feeling sweaty. If you are looking for a jacket to keep you dry – be aware of the difference between Waterproof and water resistant – they are not the same thing. If your jacket is just water resistant it means it will protect you from a bit of water, such as short light showers, but will not protect you in long lasting or heavy rain like a fully waterproof jacket will. Paying a bit more usually means better quality. Sleeping Bag – Choose from a cool summer 1-2 season bag or a thick winter 4 season down sleeping bag. Fleece – Nothing keeps you cosy like a good fleece on a chilly day at the campsite. Winter Hat – A great stocking filler for those who spend a lot of time in the outdoors. Stove – to cook up a tasty dinner on their next camping trip. First Aid Kit – when camping you should always take one. Headlamp – A headlamp is super handy as it allows both hands to be free. Rucksack -Choose from a range of feature-filled, large capacity rucksack. Folding chairs– to sit down after a day of adventuring.